We’re thrilled to introduce one of our Annual Partners, EPIC Provisions, creators of the grass-fed performance bar! Founders Taylor Collins and Katie Forrest formulated the first EPIC bar after discovering that their vegetarian/vegan diet was not cutting it for their active lifestyle. Walk through the performance bar section at your local grocery store and you’ll find the propaganda that we’ve subscribed to for far too long. “Low-Fat”, “Soy-Protein”, “High-Carb”, not to mention the hundreds of other GMO and processed ingredients that cause gastrointestinal issues and slow down productivity. Taylor and Katie set out on a journey to create the most “humane, pasture centered, and most importantly, delicious” performance bar. Their mission is to alter global food industry practices through better quality, sourcing, and transparency of the foods they produce. Along with creating delicious products that incorporate as much of each animal used as possible, EPIC’s products help employ agricultural practices that improve the lives of animals, support human health, and regenerate the land around us. You can find EPIC bars in your local Whole Foods, Thrive Market, Target, Walmart, Amazon, and several other grocery stores. 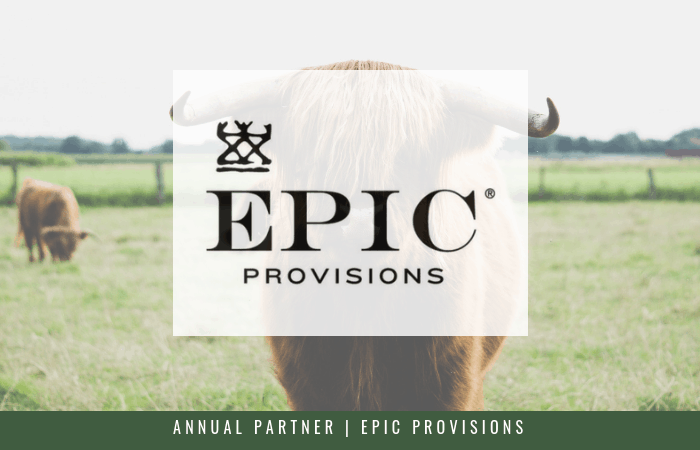 EPIC Provisions will be joining us at our Annual Conference, Roots in Portland, OR, March 1-3 you may find some of their goodies in your swag bag. Purchase your ticket today!